Bonsai Trees have been around for thousands of years. Recently I have been noticing a growing trend of interest in these charming little trees. Bonsai is simply a miniature tree. The tree needs to be specially cultivated in order to achieve its diminutive size. In traditional Japanese culture this is considered an art and requires tremendous skill. I don't exactly have a green thumb, but I do very much admire the beauty of a Bonsai Tree. The gorgeous Green Mound Juniper pictured above requires less effort to maintain. Perfect for the beginner. The tree does not require direct sunlight which makes it ideal for areas that don't receive a great deal of sun. This tree measures ten to fourteen inches tall and would look fantastic on a balcony, patio or deck. 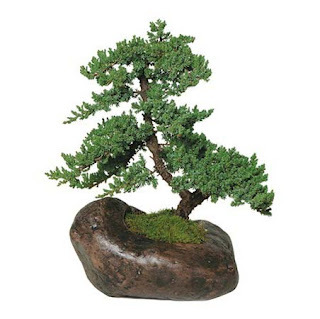 You can find the Green Mound Juniper Bonsai Tree for only fifty dollars at The Soothing Company. I saw this same tree listed for well over one hundred dollars on Amazon, so for fifty dollars this is really a bargain. Among this charming Bonsai Tree, you can also find some really nice home and garden supplies at the Soothing Company for very competitive prices. Visit their site and tell me what ya liked. I love the Eucalyptus Rocking Chair! I like the coffee table aquarium! I like the 7.5' Stainless Gardenfall With Silver Mirror Floor Fountain. Love, love, love the Waterdrop Tabletop Fountain! I love the Serenity Table-top fountain! Love the bubble wall mounted aquarium! The coffee table one, too. I like the Blenheim Two Tier Solar Birdbath! I love the wall water fountains! That XXL Fuf Foam Beanbag Chair - 7'would look good in our living room! Etruscan Chiminea Outdoor Fireplace would look great in my backyard. I love the Frog Plinth Garden Fountain...so cute and so peaceful! I love the quilted hammocks. I liked the tranquil river floor fountain a lot. I love the table aquarium! That is so cool. I really like the bliss hammock metro chair. I love the Holly and Martin™ Cypress Electric Fireplace - Espresso! I like the Aquavista AquaClock Skeleton Tabletop Aquarium. Thanks! I like the Holly and Martin™ Hallston Wall Mount Fireplace-Silver! Love the outdoor canvas art. I love the Reflection Creek Wall Fountain! I love the Tree Trunk Fountain with Light. Thanks! I like the Stretched Octagon Coffee Table Aquarium. I love the Belle TV Lift Cabinet. I love the Stacked River Rock Tabletop Fountain. I like the 5 Year Pomegranate Indoor Bonsai Tree. I would love the Natural stone finish tabletop fountain. I absolutely love almost everything on this site, I am going with the fireplaces though. I love the solitude Outdoor Canvas Art. There are so many things there I love so it really is hard to choose just one! Just being honest! I like the big bean bag chairs. My husband would really love to have an Aquarium - and they have quite a few beauties for choose from. I pretty much love all of them... But I was especially taken with the medium concave wall mount style - but honestly they are all fabulous! I also like the Bliss Hammock Quilted Cotton Hammock with Button Tuft Pillow! It's cute, and looks quite comfy. I like the Art Wall Fountains. I like the Art Wall Water Fountains. They have so many beautiful things but I really like their all electric fireplace. I love the Tree Trunk Fountain with Light. I like the Jaxx 6' Bean Bag Sofa Lounger. I love the Teton Falls Wall Fountain. :-) Thank you. I love the Aspen Falls Wall Fountain! ...Palmetto Rope Hammock Chair !! !